It is an attractive, small to medium size deciduous tree, reaching up to 9 m in height. It produces a fairly dense spreading canopy. These trees are found in a wide variety of habitats, throughout the summer rainfall areas of South Africa, extending northwards into Ethiopia and Arabia. It is said to indicate the presence of underground water. The bark is grey to dark grey, rough and fissured. The upper branch-lets are often drooping and tend to fall with the leaves in winter. The young trees have sharp, paired with dissimilar thorns, one being straight and the other hooked. Even though small, these thorns are extremely vicious, and all those that have come into contact have had to learn to ‘wait-a-bit’ (Afrikaans: wag-n-bietjie) to free themselves. The leaves occur alternately on different sides of the branchlets and are shiny green, pale green below, ovate and up to 7 cm long. Three veined from the base, the leaves can be either without hairs or with short, soft hair on the under surface. The flowers are inconspicuous, small, greenish-yellow and form tight clusters. They produce a large quantity of nectar. (November – February). During winter the flowers are followed by almost spherical yellowish, going to russet-red fruit, which often remain on the tree until the leaves fall. (March – August). This fruit has a smooth, shiny, leather-like skin that contains dry pulp which contains a wood stone incorporating two seeds. 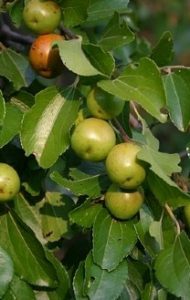 The leaves and fruits of the tree are sought out by birds and eaten by wild animals and domestic stock, and the flowers attract both birds and bees. Although seldom cultivated, it makes a pleasing little shade tree and under favourable circumstances is well suited to the smaller garden. The tree withstands drought and is moderately frost resistant. Whilst slow-growing, it succeeds in most soils and conditions. 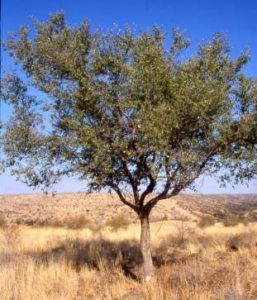 This years’ chosen tree, the Ziziphus mucronata, or as it is more frequently known, the wag-‘n-bietjie tree, is to represent life as we know it. The young twigs are zigzag, indicating that life is not always straightforward. Two thorns at the nodes are also significant; one facing backward represents where we come from and one facing forward, represents where we are going. The Z. mucronata have many uses in traditional medicine. It is a remedy for almost any pain by using the powered and baked roots as a poultice and then eaten after use. Boils and other skin infections are treated with a leaf paste, and is the accepted traditional treatment for tubercular gland-swellings. Sufferers from dysentery and lumbago may either chew the root or drink an infusion made from it, and the powered leaf and bark is used to relieve chest problems. The berries are edible and were used in making porridge or as a coffee substitute, as well as in the making of beer if fermented properly. During the Anglo-Boer war, the seeds were ground and used as a coffee substitute. This tree is considered to be immune to lightning, and offers protection to any person sheltering under it. It is also believed that if a tree is felled after the first rains, it will be followed by drought. The Zulus and Swazis used the Z. mucronata as part of the burial rites. It was customary that when a Zulu chief died, the tree was planted on his grave as a symbol of where the chief lies. Hence the name umLahlankosi– ’that which buries the chief’. A twig from the tree is still used to attract and carry the spirit of the deceased from the place of death to the new resting place. When a stock owner died, and was buried according to custom within the cattle or goat kraal, some branches were placed on the grave so that the animals who ate on the leaves and twigs, would understand that their master had died. A branch is dragged round the village to protect it from evil spirits. In South Africa, Arbor Day was first celebrated in 1983. The event captured the imagination of people who recognised the need for raising awareness of the value of trees in our society. As sources of building material, food, medicine, and simple scenic beauty, trees play a vital role in the health and well-being of our communities. Collective enthusiasm for the importance of this issue in South Africa inspired the national government, in 1999, to extend the celebration of Arbor Day to National Arbor Week. From 1 to 7 September every year, schools, businesses and organizations are encouraged to participate in community “greening” events to improve the health and beauty of the local environment and propose a green future for South Africa.